Most suitable in combination with a VFFS packaging machine. 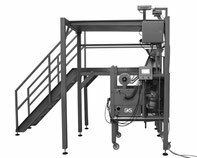 Manual infeed to a single head weigher. Available with 11 or 14 heads, with platform. Available in single or double head models, with platform.